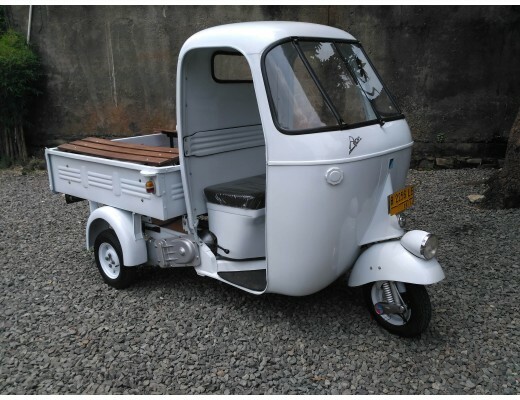 A single seated front, scooter with 3 wheels, inside using New Bajaj Ape Engine 2 stroke 150cc, the purpose of this vehicle is to loading or unloading goods, or transporting passenger with the speed up to approximately 45mph with four speed gears (including 4 forward gears and a reverse gear). The normal forward gear would still be on the left hand side handle bar just like normal Vespa (1st up, 2nd 3rd 4th down). There are a shift reserve gear on the right below driver seat. The seats is made from synthetic leather cover seat with soft sponge inside. The rear compartment made from old teak wood with dimension approximately inside width106 cm x length 110 cm x height 28.5 cm. The scooter dimension around: length 2500 cm x height 1700 cm x width 1260 cm. The front suspension is using spring & shock absorber vespa scooter, while the rear suspension using bajaj 3 wheels suspension. And the drive train has a shaft and two chains inside. The chassis is made from 2mm steel plate (rear) and 1.2mm for the front. All wheels are standard vespa 8 inches scooter wheels. All wheels are installed with brake, to feel safe when riding this three wheels scooter. The front handbrake would still be applied to front wheel, which is operating from right hand side of the steering. The rear brake has hydraulic on the deck floor, to handle heavy load goods on two wheels on the back of the scooter. There is left hand starter for the engine (pulled). The fuel tank on the right hand side can hold up to 6 liters and using mix fuel 98% of gasoline leaded or unleaded and 2% of oil. The rear brake lights are installed on the back of the compartment, which are connected to the foot brake pedal when it’s operated. The turn signals are not available. The exhaust is installed underneath the loading compartment. We will sell as is as you can see on the pictures. Term of Sale : Ex-Works and We would help to organized shipment process to your country. Shipping would cost you approximately around $800 - $850 (approx 4.5cbm) plus professional crating US$150 to your nearest port or your nearest state warehouse. Buyer will have to pay additional associated arrival fee (custom, handling, doc, warehouse port,etc) when pick up at port/shipping company warehouse, the cost depends on port and custom. Shipping would be taking about 4 until 6 weeks for shipping to USA and Canada . Please email for shipping detail cost to your country. Deposit USD500 within two days via Paypal. And the second payment (50% of payment ) must be made 6 working days. Within that time we will send you quotation for shipping and photos of crating via e-mail. 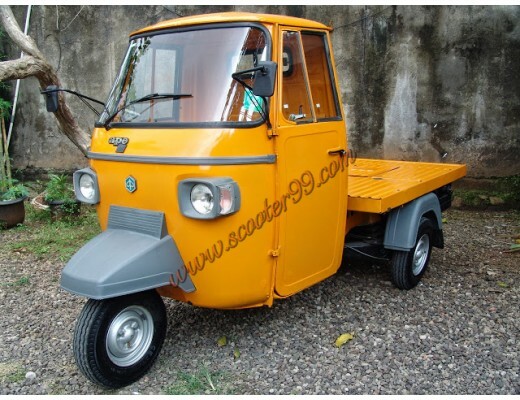 Scooter will be delivered to shipping company as soon as we received . After full payment has been received, we will express mail original Bill of Lading, Invoice, Bill of Sale and Packing list. You will have to settle the rest of the payment after the original Bill of Lading is ready. 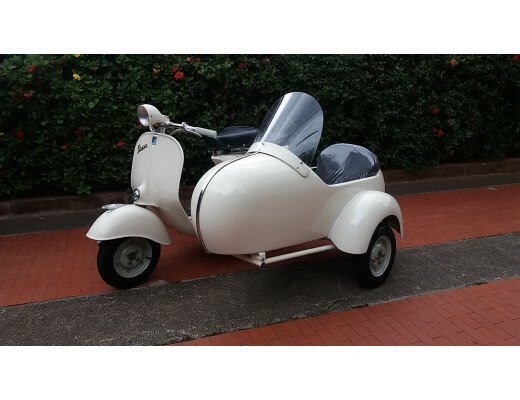 View more on: Are you looking for the amazing Ape Piaggio for sale for your commercial b..
View more on: Vespa GS 150Body Type VSNew PX Engine electric starterFully restored..